← Probing the past in L.A.
RICHARD NIXON: The Life. By John A. Farrell. Random House Audio. Read by Dan Woren. 29 hours; 23 CDs. $60. Also available in hardcover from Doubleday. There have been other biographies of Richard Nixon, the only American president to resign from office. From what I’ve read, this new one by John A. Farrell measures up well and provides some new information, most notably the revelation about how Nixon’s secret communications with the president of South Vietnam in 1968 sabotaged President Lyndon Johnson’s attempts at a peace deal, probably extending the Vietnam War for political gain. Like many others, I, however, have not read any previous biographies, so my reactions are based solely on this one. I found it fascinating, fair, enlightening and a story that became hard to put down (in my case, the kind of audio book that makes me drive farther than I meant to, because I want to hear what happens next). Many Americans born toward the end of World War II or in the early days of the baby boom, as Nixon’s two daughters were, have memories of much of what Farrell details. With scandals, the Cold War, assassinations, civil rights and antiwar protests and then Watergate, he has a wealth of material. Younger readers can gain valuable insight into how American politics and society have come to be the way they are. Much of what we struggle with today has its roots in the story Farrell tells so well. I was privileged to be a young journalist on the national news desk at The Sun in Baltimore, just up the road from D.C., when Nixon’s vice president, Spiro Agnew, resigned in disgrace and during the Watergate scandal. Even though I lived and breathed the news events of those days, I learned a lot from Farrell’s book. In addition to information that was not known at the time, his insightful treatment provides the sort of context and perspective that are in short supply when dramatic events are unfolding. One of Farrell’s most impressive achievements is the way he manages to describe the life of this complex man with great fairness and even, at times, compassion. He is more sympathetic to Nixon than might be expected, but he never fails to point out the man’s flaws and failings. The Nixon he describes is clearly a tragic figure in the classical sense, a man with much greatness but also with flaws that lead to his own destruction. 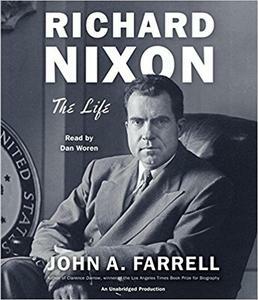 While not indulging in too much amateur psychoanalysis, Farrell does make a good case for the warring drives that motivated Nixon – the good instincts inherited from his Quaker mother, whose approval he was never quite sure of, and the sometimes ruthless determination to fight and win that came from his harsh father. Though Nixon was intelligent and accomplished, he never got over his feelings of insecurity. Those feelings made him thin-skinned to the point of being paranoid. He also came to believe that he was on a mission, and that whatever it took to keep him in power and help him to achieve his goals was justified. Nixon did many bad things, although part of what Farrell accomplishes is to show that he was not the first or the only one to commit many such transgressions – he just went further, and in a more reckless way. He also did a number of good things that tend to be forgotten, including more to help the environment than any president since Theodore Roosevelt. Farrell’s book inevitably sparks discussion about the many parallels between Nixon and Donald Trump, the man who surprisingly became president while this book was about to be published. The most notable similarity is their extreme distrust and hatred of the press. But, as others have pointed out, there are many ways in which these two men are quite different. Nixon came from a working-class family, and even when he was hobnobbing with the wealthy and mingling with world leaders, he never felt that he belonged. Nixon was a professional politician, not an outside amateur, having worked his way up from congressman to senator to a two-term vice president, and having weathered some difficult defeats, before reaching the White House. Nixon, highly intelligent, did much research and was deeply involved in policy decisions. He was plagued with self-doubts. And yet … the similarities are disturbingly there. One of the oddly comforting takeaways from Farrell’s book, however, is that the United States has survived even through times when its leaders fell far short of its ideals and terrible events threatened our democracy. This is a fine biography, a good story as well as well researched and documented history. Dan Woren’s presentation in the audio version is just right, making the listener feel like an intimate witness to history. This entry was posted in American History, Audio Books, Biography, Contemporary Nonfiction, History, Politics and tagged 20th century American history, Biography, John A. Farrell, Richard Nixon. Bookmark the permalink.